I’ve been spending a little time dabbling with fiction recently, though none of it is polished enough to be published here just yet. Tonight, I’m hoping to draw some inspiration from other writers at a special ‘Women with Extraordinary Stories’ event. The event is being hosted by the Arts Council of Northern Ireland as part of this month’s One City, One Book initiative. 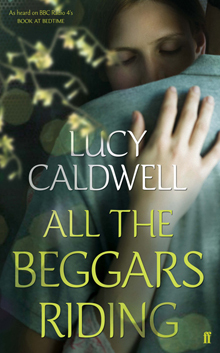 Throughout May, events have been held across Belfast to celebrate the latest novel by local author, Lucy Caldwell – All the Beggars Riding. The initiative is essentially a community reading programme, which has, over the last month, encouraged everyone to read and discuss Lucy’s latest novel. I’ll hold my hands up at this point and admit that I haven’t read the book, but I do intend to. Regrettably, I’ve also missed a lot of the One City, One Book events this month but I’m glad to be getting along to this one. Journalist Letitia Fitzpatrick will join Lucy Caldwell to discuss her experience of living with loss, following the death of her husband from cancer. Melanie Grimsley, who survived a horrific car fire as a child and endured hundreds of operations, will tell her story to journalist, Ivan Little. The Fermanagh mum of two is now training to be a lawyer and recently published her autobiography. I have the greatest admiration for these women and hope that hearing their stories tonight will give me a renewed enthusiasm to get back to my own writing. For anyone that’s interested in coming along, the event takes place tonight (Monday 27th May) at the Arts Council of Northern Ireland, Malone Road, Belfast at 6pm. The event is free to attend.